The performance of a molecularly imprinted polymer (MIP) as a selective solid-phase extraction sorbent for the clean-up and preconcentration of the antibiotic chloramphenicol is described. The MIP was prepared using chloramphenicol as the template, (diethylamino)ethyl methacrylate as the functional monomer, and ethylene glycol dimethacrylate as the cross-linking monomer, and using tetrahydrofuran as the solvent. 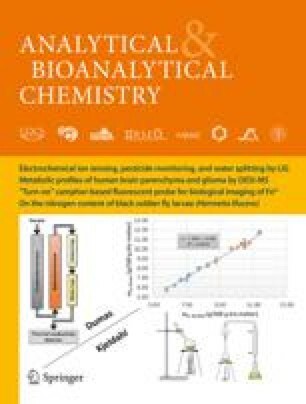 Detection of chloramphenicol was carried out by square-wave voltammetry at electrochemically activated carbon fiber microelectrodes. Chloramphenicol was eluted from the MIP microcolumn with methanol. Different experimental variables (sample pH, eluent volume, analyte and eluent flow rates and sample volume) associated with the rebinding/elution process were optimized. For a 250 mL sample, a nominal enrichment factor of 500 was attained, and for a chloramphenicol concentration of 3.0×10−8 mol L−1 (9.7 μg L−1) a recovery of 96±4% was obtained. A range of linearity for chloramphenicol between 3.0×10−8 and 1.0×10−5 mol L−1 was obtained by loading 17 mL of analyte solutions of different concentration, eluting with 0.5 mL methanol, evaporating under a stream of nitrogen and dissolving the residue in phosphate buffer of pH 7.8. The MIP selectivity was evaluated by checking several substances with similar molecular structures to that of chloramphenicol. The applicability of the MIP for both clean up and preconcentration was demonstrated by determining chloramphenicol in ophthalmic solutions and spiked milk at different concentration levels. Financial support from the Ministerio de Ciencia y Tecnología (project BIO2000-0928), and the Project BQU (2001-2050) are gratefully acknowledged. M.L. Mena wishes to thank the Comunidad de Madrid for a postdoctoral grant (4323/2000).